To control storage costs, you can (optionally) set a budget for your computer's backups. To set it up, open "Preferences" (from the "Arq" menu) and click the "Destinations" tab. Double-click your destination. 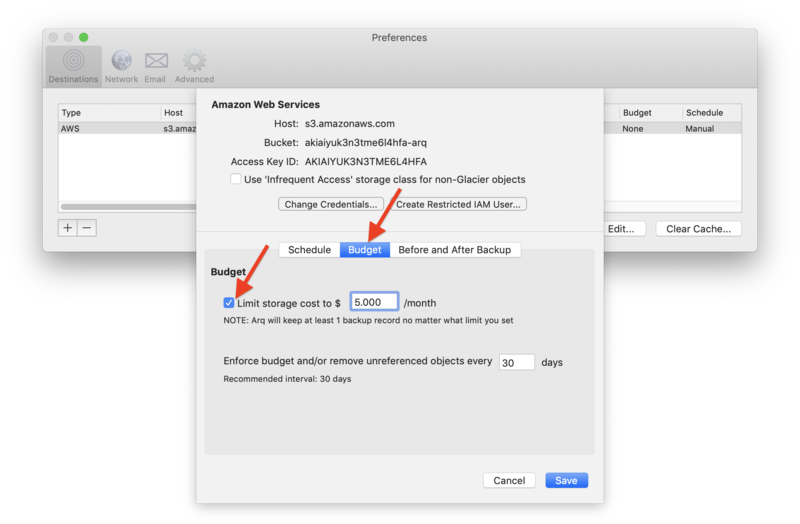 Then check the "Limit storage cost" checkbox and enter a cost in dollars or GB. Arq Agent periodically calculates the total storage being used for your computer's backups. If the total is over the budget, Arq Agent drops the oldest backups across all backed-up folders until the storage is within the budget. NOTE: Arq Agent always keeps at least 1 backup of each folder, even if that means the storage is over budget. When Arq Agent finishes dropping old backups, it deletes any objects that are no longer referenced by any backup version. During the budget enforcement process, Arq Agent checks to make sure that all objects referenced by backups are still in your backup data. If an object is missing, Arq drops the backup version. If it's the newest backup version for the folder, Arq will create a new backup for that folder during the next backup cycle.